FlexNet Code Insight, designed for installation and use on-premises, has a full set of enterprise-ready features to allow operation within a modern and secure IT environment, allowing you to keep your valuable source code on-premises. User management can be done directly within FlexNet Code Insight or via interconnection with existing LDAP and Single Sign-On (SSO) systems. Application security is maintained through continuous testing against known attack vectors. Can be used without connection to the external internet for secure environments. Update service adds components, versions, licenses, rules and vulnerabilities weekly to ensure the system is provisioned with the latest information. FlexNet Code Insight scans your applications to identify Open Source components in Source code, Software packages, Binaries, Code Snippets, Build dependencies, Docker containers and Multimedia files. The product also detects Copyright, Email/URLs and Custom Search terms to find evidence of OSS in your applications. You can adjust the depth and breadth of scan and analysis based on your project. A quick scan helps you prioritize issues based on a high-level overview. Trigger deep scans where necessary to create a detailed and complete analysis. Identify known vulnerabilities associated with the open source in your applications and get alerts when new vulnerabilities affecting you are reported. 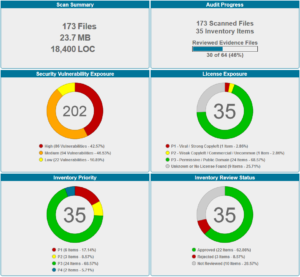 Analyze security risks within projects with easy-to-understand dashboards and reports. FlexNet Code Insight includes a robust framework supporting multiple data sources for vulnerability data, including NVD and advisories from Secunia Research at Flexera. Identify open source licenses and drill down into license details and risk. FlexNet Code Insight automates the creation of an accurate Bill of Materials (BOM) to ship with your products. This enables you to comply with license obligations that come with open source software and protect your IP. Automate the review of commonly used components based on your company license policy. Developers can select components they intend to use, and submit for review. Developers also have access to usage guidance after a component is approved for use, or remediation notes if the component is rejected. Integrate open source scanning into your DevOps environment using the FlexNet Code Insight’s plugins for Jenkins and Docker. This allows you to scan your code and identify dependencies from the build environment. Integrate any external audit data into FlexNet Code Insight and develop your own plugins using the Scan Agent Framework. Create custom dashboards and reports with automated findings, audit and vulnerability information using REST APIs. Are we exposed to a specific vulnerability? Are we exposed to high priority license issues and/or high severity vulnerabilities? Where are our outdated components? Where should we focus our limited analysis resources? Where are the issues that need attention now?